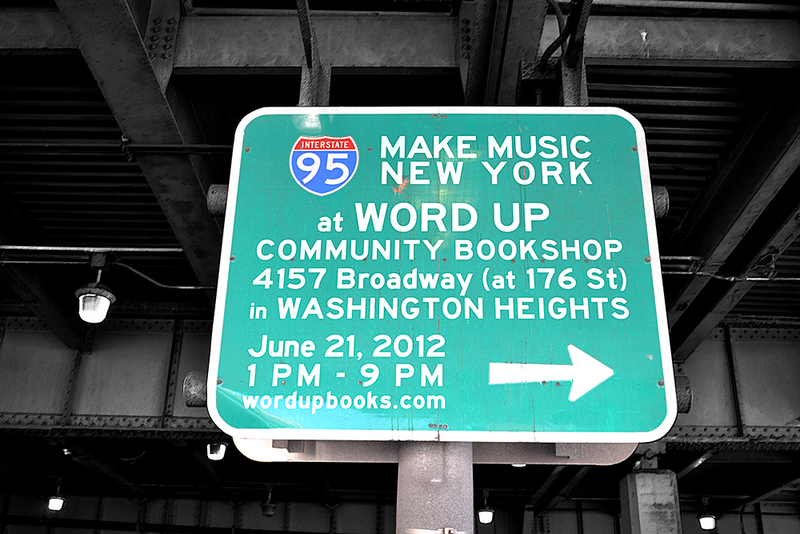 ← Word Up’s 1st Birthday Party TONIGHT! Thank you all for making our first birthday so wonderful. We haven’t quite recovered yet(!) but will pass on a full report—photos, videos, and all—very soon. As for the Birthday Fund Drive, we fell a little short of our $10,000 goal, but not by much. A hearty, hearty thank you for all who donated, or otherwise contributed; we begin Year 2 on much sturdier footing thanks to you. And to anyone who still would like to donate, please do! Though our Birthday Fund Drive is over, the action at Word Up is far from over. Today, for instance, we are a venue for Make Music New York. The sidewalk in front of Word Up will be a stage from 1 to 9pm! The full schedule is below. All performances will be streamed live on whfr.org. 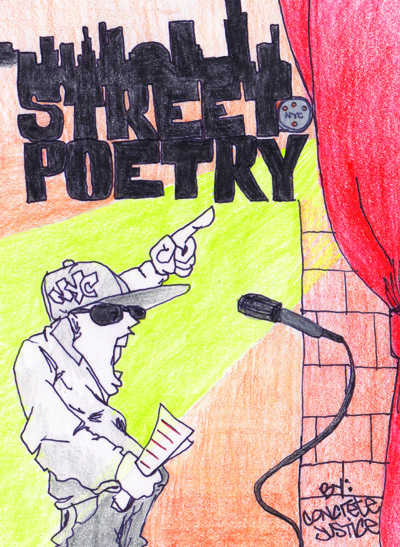 Tomorrow, we have special guests Concrete Justice—a collective of homeless and formerly homeless artists in NYC—hosting our open mic, and then launching their own book, Street Poetry. Arrive at 6pm for the open mic, then stay to hear Concrete Justice read from their new collection, Street Poetry, starting at 7pm—followed by a book signing and party! Free refreshments will be provided, and books will be available. Hosted by Theatre of the Oppressed NYC with Places for All and Fractious Press. Visit www.theatreoftheoppressednyc.org for more info. We keep going through the weekend, with the fruits of two Word Up volunteers’ labors launching on Saturday. On Saturday from 11am to 1pm, join Jen Monsen Leach for the book launch of Not Now, Ollie!—a children’s book about a wise Pug who teaches his busy owner a thing or two about making time for what’s important. Self-published as a Kickstarter project last December, Jen Monsen Leach raised over $5000 to produce this book. Featuring original illustrations, the book will appeal to kids and Pug people of all ages. Jen will also have her crafty creations from pennymadeit for sale. Then Saturday from 6 to 9pm, join drummer/producer Will Glass for the second Alighting Records release, a collection of improvised live hip hop entitled Beat Fields. 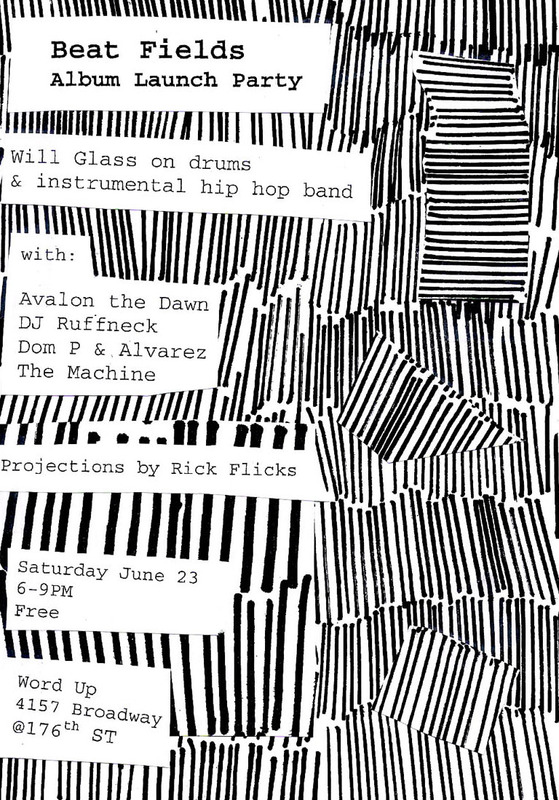 In celebration, we’re hosting a multimedia showcase of Heights hip hop, featuring Will Glass on drums with Ben Abrams (keys, bass), DJ Ruffneck (turntables), and The Machine, Dom P and Alvarez (on guitar), Avalon the Dawn, and more. Video graffiti projections by Rickflicks. The evening will conclude with an open mic cipher—so MCs, bring your rhymes!